The Tesla Model X comes with an optional $750 tow package which includes a 2″ hitch receiver capable of towing a boat or any payload below 5,000 lbs. with 19″ wheels and 3,500 lbs. with the larger 22″ wheels. The SAE Class III hitch itself comes pre-installed onto the rear frame of the vehicle and goes generally unnoticed since the opening to the hitch receiver is covered by a plastic panel beneath the car. A plastic cover plate beneath the Model X rear diffuser prevents dirt and debris from entering the receptacle for the detachable hitch receiver. Tesla also includes a bag of accessories that comes as part of the tow package including the detachable 2″ hitch receiver itself and a wiring harness for trailers equipped with its own electronic brakes. Unless you’ve worked with a hitch adapter or hitch with ball mount before, installing Tesla’s lockable hitch could come off a bit daunting of a task. This is largely due to the spring loaded lock-dial found on the detachable hitch that allows owners to secure the hitch to the vehicle using a key. Installing the hitch receiver requires that you first unlock the locking assembly using the provided key. Lift the white flap, insert the red key and turn it counter-clockwise. The next step requires that you pull the round spring loaded lock-dial outward before rotating it clockwise until the assembly locks into place. At that point the hitch receiver is ready to be installed. Remove the plastic cover beneath the rear diffuser and insert the unlocked hitch receiver directly into the hitch receptacle. Firmly push upwards until the round lock-dial with key rotates counter clockwise and snaps itself back into place. The hitch receiver is secured to the vehicle at this point and ready to be used with any rack or trailer that’s compatible with a 2″ hitch. Here’s an example of Yakima’s FullSwing premium bike rack installed onto our Model X. It’s worth noting that we looked at several bike racks that would allow us to easily open the rear hatch without having to remove the bike, but also allow us to Supercharge (don’t be this guy) and found this one to do the job quite well. It’s certainly not the cheapest but that’s also reflected in the build quality and the unique swing-out design. 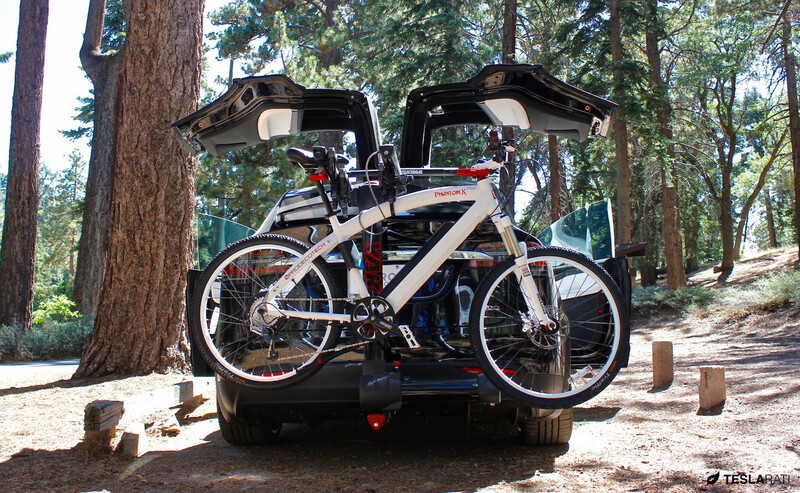 Read our in-depth review of Yakima’s FullSwing bike rack for the Tesla Model X and see why we decided to choose a swing away type rack over Tesla’s own hitch rack.